Carney does it again! The Bank of England (BOE) head just announced new measures that could help improve the economy’s “solid but not stellar” growth. Primarily, the central bank’s plan is to relax rules and make it easier for banks to lend. But he didn’t stop there! He also remarked that the central bank is prepared to inject fresh stimulus if the recovery wavers. Carney didn’t seem pleased with how markets have been behaving, upping their expectations for a rate hike. According to him, expectations for higher interest rates could destabilize the economy’s recent progress. To set things straight, the BOE head flat out said that there won’t be any rate hike until unemployment hits 7%. He also threatened to launch more stimulus measures if premature rate hike expectations get in the way of the recovery. Pretty dovish words, eh? 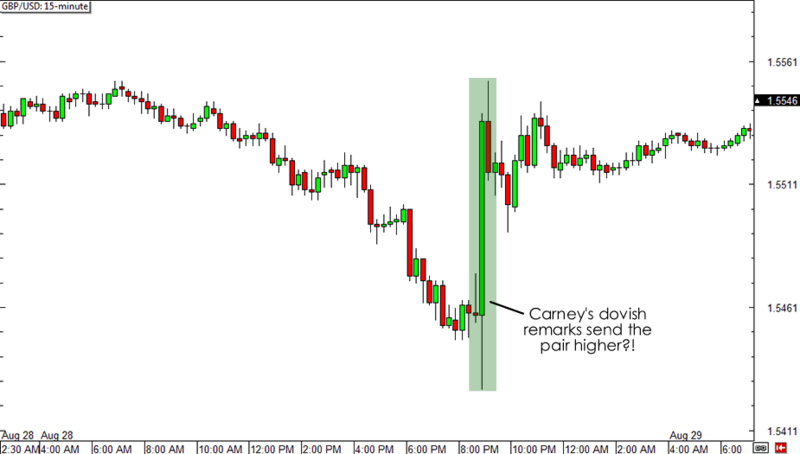 This explains why GBP/USD sold off immediately after Carney’s initial remarks. But the pair very quickly pared its losses. In fact, it rose over 100 pips in just a matter of minutes! You’re probably sitting there scratching your head and wondering why the pound reacted that way. After all, doesn’t talk about easing usually lead to currency weakness? Well, simply put, the markets didn’t buy Carney’s words. Despite the warning about further easing, we saw U.K. government bonds dip and the pound rally as traders just refused to believe that the Bank of England will be able to keep interest rates at record lows until 2016. Basically, they’re betting that the economic recovery will pick up and force the BOE to raise rates in 2015. It can also be said that the pound was lifted by a few optimistic remarks from Carney himself. For one, he claimed that the economic improvements that we’ve seen are broad-based and will likely continue. He even admitted that the U.K. has solid growth prospects. But then again, did we really need him to tell us that? After seeing the U.K.’s recent economic releases, who wouldn’t feel optimistic for the U.K.? There are also those that believe that Carney’s commitment to low interest rates and an accommodative policy will lift household and business confidence and boost economic activity. Overall, given the current state of the U.K. economy (one that many countries would envy), the prospect of additional easing seems to be more of a safety net- it’s more of a “just-in-case” measure rather than a necessity. That being said, I wouldn’t expect it to drag down the pound in the long run. How do you think Carney’s speech will affect the pound in the long run?